Ok, first of all, I think Nicole Kidman is one of the most beautiful – if slightly stiff and porcelain – women in the world, and I can’t wait to see her daughter grow up. Second of all, how cute is Sunday Rose? Nicole Kidman has struggled with fertility her whole life, to the extent that when she was 25 she and Tom Cruise decided to adopt two children: Connor and Bella. Then out of nowhere, she got pregnant last year with husband Keith Urban while filming Baz Luhrmann’s latest epic, “Australia”. Kidman, in a promotional pic for her new film, with co-star Hugh Jackman. To what does Kidman, 41, credit the miracle of Sunday Rose, the little girl she gave birth to this past July? 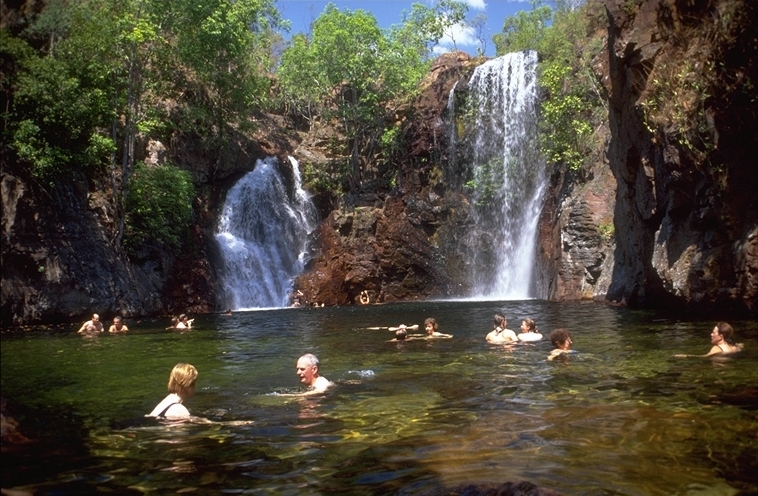 The Kununurra waterfalls in Australia, where they were filming the movie. The fertile waters of Kununurra. Nicole & Sunday Rose this summer. How nutty is that? SEVEN babies? Nifty!